Heat olive oil in large sauce pan or dutch oven over medium heat. Add onion, celery and carrot. Cook until vegetables begin to soften about 5 minutes. Stir in garlic, rosemary, thyme red pepper flakes and black pepper. Cook one minute. 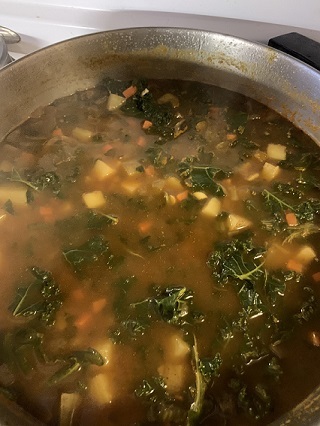 Add potatoes and vegetable broth. Bring to a boil over medium-high heat. Decrease heat to a lively simmer and cook for 15 minutes. Add beans. Cook until potatoes are tender, usually 10 or 15 minutes. Stir in Kale and spinach. Cook until just wilted about one minute. Season with salt and serve. What is Resistant Starch and Why Should We Eat It?